Long before William Faulkner got his big break in literature, he, like many of us, had a good old-fashioned day job. Faulkner had a series of odd jobs in fact. But, most famously, he worked from 1921 to 1924 as the postmaster at the University of Mississippi, where, according to legend, he did the following: sometimes threw mail in the garbage, other times read magazines before bringing them to people's homes, often played cards and wrote fiction during working hours, occasionally went golfing instead of delivering mail, and generally ignored his colleagues and customers. But, who could blame him? Especially when he earned $20,000 in today's money and had great literary ambitions to pursue. Eventually, when a postal inspector came to investigate, Faulkner resigned. The resignation letter, recently highlighted by Letters of Note, is short (a mere 56 words) and cutting. 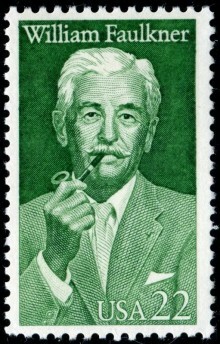 But, scathing as it was, it didn't stop the US postal system from issuing a commemorative Faulkner stamp in 1987.